The quality of the source water used to produce pharmaceutical water plays an important role for both the design of the treatment and the validation of the water system. FDA Warning Letters over the past few years have shown that compliance with the specification of pharmaceutical water is not enough. A validation of the treatment process is expected. This includes documentation of the process capacity to produce pharmaceutical water according to specification. If we do not know the quality of the source water, however, the purification capacity is not known either. As a consequence, fluctuations of the quality of the source (feed) water quality may lead to water that does not comply with the specification after purification. Or it is not known up to which quality level of the source water pharmaceutical water that complies with the specification can be produced. Therefore, it is important to know the impurities respectively their concentration in the source (feed) water. 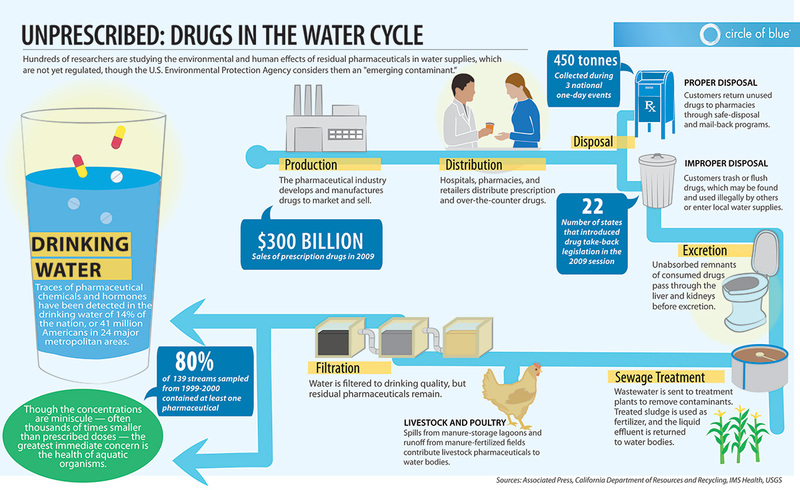 The production of pharmaceutical water is always based on drinking water. The specifications for drinking water however (for Germany, stipulated in the Trinkwasserverordnung; for the U.S., in the National Primary Drinking Water Regulation) are defined very broadly compared to Pharmacopoeial specifications. The quality of the drinking water varies widely as well, as drinking water may come from different sources (ground water or surface water). Even the ground water quality varies locally, e. g., depending on the season. This is why water purification plants for the pharmaceutical industry are not ready-made goods, but individual solutions that have to be developed by the future user and the plant supplier together. The plant supplier will always ask about the quality of the drinking water so that he can offer the appropriate processing technologies. In particular, he will need the following information. For this purpose, it is useful to provide the plant engineer with various drinking water analyses over a minimum period of twelve months. For the design of a pharmaceutical water plant, the indicator parameters according to the Trinkwasserverordnung (conductivity, iron, manganese, sulphate and pH value) are important, as the amount of the ionic load determines the treatment process. For instance, a single-stage or double-stage reverse osmosis may be sufficient to obtain adequate quality at low conductivity levels. Iron and manganese are limited by the drinking water ordinance, but will lead to irreversible membrane damage at the reverse osmosis plant when their limits (according to the Trinkwasserverordnung) are exceeded. Furthermore, information on the total hardness is indispensable, as it has a major influence on the design of the softening plant – as well as on carbonate hardness or base capacity which are used to calculate the amount of dissolved carbon dioxide. This parameter restricts the use of EDI or may require further treatment, such as membrane degassing. Depending on the origin of the drinking water, a responsible plant engineer should measure the colloid index (SDI 15) before designing the plant. Especially with surface water, higher amounts are to be expected. 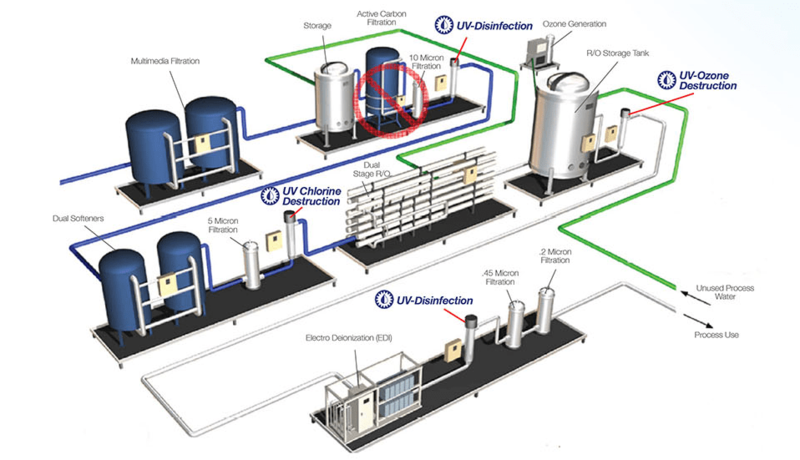 A colloid index of more than 5%/min can already have a negative impact on the operation of a reverse osmosis plant (membrane blocking and/or fouling) and may require additional treatment techniques, such as ultrafiltration before the main plant. While the colloid index is never determined via the water supplier, the silicate content is often indicated in the drinking water analysis. A silicate content of more than 25 ppm can become critical for a combination of reverse osmosis and EDI and should also be determined in case it is not indicated in the analysis. All microbiological parameters have been regulated in the Trinkwasserverordnung. However, you should always remember that the supplier guarantees the quality only up to the point of transfer. With regards to the total bacteria count in particular, regular tests are necessary in order to identify seasonal fluctuations. The 2nd supplement of USP39 NF34 comprises the revised version of the chapter on pharmaceutical water of the US Pharmacopoeia <1231> Water for pharmaceutical purposes. The 2nd supplement of USP39 NF34 comprises the revised version of the chapter on pharmaceutical water of the US Pharmacopoeia <1231> Water for pharmaceutical purposes. The first draft version had already been published in September 2015 in the USP Pharmacopeial Forum 41(5). First of all: there are no new or revised specifications of individual test parameters or new requirements. But the chapter has been revised structurally to ensure better readability. In addition there are now also details regarding feed water as well as for the validation and on action and warning limits. With a chapter number greater than 1000 the Chapter <1231> is not binding, but has a recommending character. The recommended temperature for hot sanitising was changed. So far temperatures of 80 ° C and greater were recommended. Now these are 65-80 ° C. Regarding the action and warning limits the USP now comprises proposals how these can be set 2 – and 3-stepped and which rationale can be used for the limit-setting. Further, the revised chapter now also provides assistance for organising sampling plans for the validation and operational phases. The revised version of the Chapter <1231> will become effective in December 2016 and can be found in the 2nd supplement to the USP39 NF34. According to the revised monograph, it will be allowed in Europe in future to produce WFI with a purification method equivalent to distillation like e.g. reverse osmosis coupled with appropriate techniques. Moreover, the EDQM declares that a notice to the respective supervisory authorities will be required when a “non-distillation” technology is used for the production of WFI. Besides, the EDQM points out that it is not only a matter of equivalence of a specification but rather the robustness of the purification of WFI. Therefore, Annex 1, which is currently under revision, will also include requirements with regard to the production of WFI. The new Annex 1 will be available when the revised monograph becomes applicable. With the modification of this monograph, harmonisation with the US Pharmacopeia and the Japanese Pharmacopeia goes one step further. In both countries, non-distillation technologies for the production of WFI are already allowed. The revised monograph Water for Injections (169) will be published in Ph.Eur. Supplement 9.1 and apply as of April 2017. For further information please see the EDQM’s press release. Frequent Asked Question: Which Level of Ozone is Required in a Hot- or Cold-Stored WFI System? Ozone can be used for the sanitisation of water systems. Which level of concentration is required in water – i.e. in WFI – depends on different factors. Read more about the sanitisation of water systems with ozone. The usage of ozone is only senseful in cold water systems. But the decisive question is whether ozone is used for a short-term (1-2 hours) or for a long term (> 6 hours) prevention of microbial growth. In the first case, > 50 ppb ozone is generally sufficient whereas in the second case at least 20 ppb are required. One should keep in mind that WFI cold systems have basically a higher risk of microbial contamination. The need for ozone in large ring systems or in areas difficult to access may be higher. The ozone levels mentioned should thus be achieved in the return flow. Setting the correct ozone concentration for the system must be done within the scope of the PQ – i.e. validation of the water system. In contrast, ozonisation of hot-stored WFI systems doesn’t make sense. Indeed, the half-life of ozone considerably decreases at temperatures over 40° Celsius. Moreover, the heat in hot WFI system causes sanitisation itself; the usage of additional ozone wouldn’t be meaningful. The risk of biofilm formation in hot-stored WFI systems is considerably lower. Microbiological Test of Water is provided to determine compliance with the requirements given in individual monograph/specifications. Microbial testing of water includes the estimation of the number of viable aerobic bacteria present in a given quality of water. Dissolve 34 g of monobasic Potassium phosphate in about 500 mL of water contained in a 1 L volumetric flask. Adjust to pH 7.2 ± 0.1 by the addition of 4 % w/v aqueous solution of Sodium hydroxide (about 175 mL), add water to volume, and mix. Dispense, sterilize and store under refrigeration. For use, dilute the Stock solution with water in the ratio of 1 to 800, and sterilize in an autoclave at 121 OC for about 15 min. Dissolve the solids in the water, warming slightly to effect solution. Cool to room temperature and add, if necessary, sufficient 0.1 N Sodium Hydroxide to give a final pH after Sterilization between 7.1 and 7.5. Filter, if necessary, to clarify, distribute into suitable containers and sterilize in an autoclave at 121 OC for about 15min. For double strength medium, use double the quantity of ingredients in the same amount of water. All the above media should be incubated for 24 h at 37 OC before use. Any contaminated media should be discarded. Instead of preparing media, use dehydrated media of Hi media can be used. Re hydrate the required quantity as per instructions on the bottle label, dispense in required quantities and sterilize at 15 psi at 121 OC for 20 min. 121 OC for 15 min. and allow to cool. Transfer 100 mL of water sample to the unit and filter it under aseptic conditions, by applying vacuum. Transfer the membrane intended for enumeration of total bacterial count onto the surface of nutrient agar OR Soyabean casein digest agar and incubate at 37 OC + 2 °C for 3 days. Repeat the filtration process with 100 mL sample. Observe the plates for development of colonies and report the results as Colony forming units (CFU) per 100 mL sample. 1. Transfer aseptically 1 mL of the sample in each of two sterile Petri dishes. 2. Add to each dish approx. 20 mL of sterile nutrient agar / Soyabean casein digest agar previously cooled to about 45OC3. Cover the petridishes and mix the sample with the agar by rotating the dishes 3 times both in clockwise and anti-clockwise directions. 4. Allow the agar to solidify at room temperature. 5. Invert the petridishes and incubate them at 37 OC for 48 h.
6. After incubation, examine the plates for growth and count the number of colony forming units in each plate. 7. The average of both the readings is the total microbial count per mL. Perform the Total microbial Count as follows . 2. Transfer 1 mL from this to two sterile Petri dishes. Add sterile nutrient agar / Soyabean casein digest agar to them in the same manner as above and incubate at 37 OC for 3 days. 3. After incubation, note the number of colony forming units in each plate and calculate the average. 1. Perform the test for identification of Escherichia coli as per STP No. STP-046-00. 2. Perform the test for most probable number of coliforms as follows. Transfer aseptically 10 mL sample into each of five previously sterilized 10 mL double strength MacConkey’s broth tubes Similarly transfer 1 mL and 0.1 mL sample in 10 mL single strength MacConkey’s broth tube using 5 tubes for each sample quantity. Incubate all tubes at 37 OC for 48 h. and observe for gas production. 3 The number of positive findings of coliform group of organisms should be computed as the combination of positives and recorded in terms of most probable number (MPN) . The MPN for a variety of combinations isgiven in the Table I. Keep adequate controls of Phosphate buffer pH 7.2, Nutrient agar and MacConkey Broth to confirm the validity of results. Observe the sample by physical examination in a 100 ml Nessler’s cylinder. The sample shall be clear. Check the odour of the sample. Report for any unusual odour. Color is determined by visual comparison of the sample with known concentrations of colored solutions. Collect representative samples in clean glassware. Make the colour determination within a reasonable period because biological or physical changes occurring in storage may affect color. With naturally colored waters these, changes invariably lead to poor results. Apparatus : Nessler tubes, matched, 50 mL, of tall form. 1. Dissolve 1.246 g of Potassium Chloroplatinate [K2PtCl2], [eq. of 500 mg metallic Pt.] and 1.00 g of crystallized cobaltous chloride [CoCl2 6H2O], [eq. to 250 mg of metallic Co] in distilled water with 100 mL conc. HCl and dilute to 1000 ml with distilled water.This stock standard has a colour of 500 units. 2. 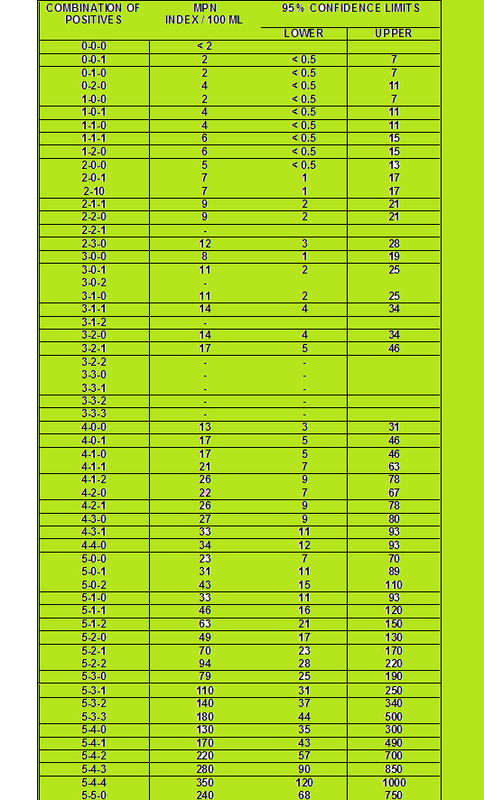 Prepare standards having colors of 5, 10, 15, 20, 25, 30, 35, 40, 45, 50, 60, and 70, by diluting 0.5, 1.0, 1.5, 2.0, 2.5, 3.0, 4.0, 4.5, 5.0, 6.0, and 7.0 mL stock color standard with distilled water to 50 mL in Nessler Tubes. Protect these colour standards against evaporation and contamination when not in use. Observe sample color by filling a matched nessler’s tube to the 50 mL mark with sample and comparing it with standards. Look vertically downward through tubes toward a white or specular surface placed at such an angle that light is reflected upward through the columns of liquid. If the turbidity is present and has not been removed, report as ‘apparent color’. If the color exceeds 70 units, dilute sample with distilled water to known proportions until the color is within the range of the standards. Color Units = [Estimated Color of diluted sample x 50 ] / mL sample taken for Dilution. Instrument : The pH meter should be capable of reading with an accuracy of 0.05 pH Units. Calibration with Standard Buffer solutions : Before sample pH measurement perform calibration of the instrument with pH 4.0 buffer and pH 9.0/9.2 buffer. Sample measurement : Establish equilibrium between electrodes and sample by stirring sample to ensure homogenity ; Stir gently to minimize carbondioxide entrainment. Measure the sample pH at 25C. Report pH value to the nearest 0.1 pH unit. Principle : Ethylenediaminetetracetic acid and its sodium salts [EDTA ] form a chelated soluble complex when added to a solution of certain metal cations. If a small amount of a dye such as Eriochrome BlackT or Calmaginte is added to an aqueous solution containing calcium and magnesium ions at a pH of 10.0 ± 0.1, the solution becomes wine red. If EDTA is added as a titrant the calcium and magnesium will be complexed, and when all of the magnesium and calcium has been complexed the solution turns from wine red to blue, marking the end point of the titration. Magnesium ion must be present to yield a satisfactory end point. Conduct titration’s at or near normal room temperature. The color change becomes impractically slow as the sample approaches freezing temperature. Indicator decomposition becomes a problem in hot water. Completion to the titration within 5 min. minimizes the tendency for CaCO3 , to precipitate. 1. Dissolve 16.9 g Ammonium Chloride [(NH4Cl)], in 143 mL, conc. ammonium hydroxide [(NH4OH)]. Add 1.25 g magnesium salt of EDTA[commercially available ] and dilute to 250 mL with distilled water. 2. If the magnesium salt of EDTA is unavailable, dissolve 1.179 g disodium salt of ethylenediaminetetraacetic acid dihydrate (analytical reagent grade) and 780 mg magnesium sulfate [(MgSO4.7H2O)] or 644 mg magnesium chloride [(MgCL2.6H2O)] in 50 mL distilled water. Add this solution to 16.9 g NH4Cl and 143 mL of conc. NH4OH with mixing and dilute to 250 mL with distilled water. To attain the highest accuracy, adjust to exact equivalence through appropriate addition of a small amount of EDTA or MgSO4 or MgCl2. called ethylene glycol mono methyl ether). Add 2 drops per 50 mL solution to be titrated. Adjust volume if necessary. Standard EDTA Titrant, 0.01M : Weigh 3.723 g analytical reagent – grade disodium ethylenediaminetetraacetate dihydrate also called (ethylenedinitrilo) tetraacetic acid disodium salt (EDTA) , dissolve in distilled water, and dilute to 1000 mL , standardize against Standard Calcium Solution as described in method given below. Standard Calcium Solution : Weigh 1.000 g anhydrous CaCO3 powder [primary standard or special reagent low in heavy metals, alkalis, and magnesium] into a 500 mL erlemeyer flask. Place a funnel in the flask neck and add, a little a time, 1+1 HCl until all CaCO3 has dissoved. Add 200 mL distilled water and boil for few minutes to expel CO2 . Cool, add a few drops of methyl red indicator, and adjust to the intermediate orange color by adding 3N NH4OH or 1+1HCl, as required. Transfer by quantitatively and dilute to 1000 mL with distilled water: 1 mL = 1.00 mg CaCO3. Select a sample volume that requires less than 15 mL EDTA titrant and complete titration within 5 minutes measured from time of buffer addition. Dilute 25.0 sample to about 50 mL with distilled water in a porcelain casserole or other suitable vessel. Add 1 to 2 mL buffer solution. Usually 1 mL will be sufficient to give a pH of 10.0 to 10.1. The absence of a sharp end-point color change in the titration usually means that an inhibitor must be added at this point or that the indicator has deteriorated. Add 1 to 2 drops indicator solution or an appropriate amount of dry-powder indicator formulation. Add Standard EDTA titrant slowly, with continuous stirring, until the last reddish tinge disappears. Add the last few drops at 3- to 5-s intervals. At the end point the solution normally is blue. Daylight or a daylight fluorescent lamp is recommended highly because ordinary incandescent lights tend to product a reddish tinge in the blue at the end point. Potassium Chromate Indicator Solution : Dissolve 50 g K2CrO4 in a little distilled water. Add AgNO3 solution until a definite red precipitate is formed. Let stand 12 h, filter, and dilute to 1 L with distilled water. Standard Silver Nitrate Titrant, 0.0141 M (0.0141N): Dissolve 2.395 g AgNO3 in distilled water and dilute t 1000 mL. Standardize against NaCl by the procedure of “Titration” described below. 1.00 mL = 500 µg of Cl-. Aluminium Hydroxide Suspension : Dissolve 125 g aluminium potassium sulfate or aluminum ammonium sulfate, AlK(SO4)2.2H2O or AlNH4(SO4)2.12H2O, in 1 L distilled water. Warm to 60o C and add 55 mL conc. ammonium hydroxide (NH4OH) slowly with stirring. Let stand about 1h, transfer to a large bottle, and wash precipitate by successive additions, with thorough mixing and decanting with distilled water, until free from chloride . When freshly prepared, the suspension occupies a volume of approximately 1L. Sample Preparation : Use a 100 ml sample or a suitable portion diluted to 100 mL. If the sample is highly colored, add 3 mL Al(OH)3 suspension, mix, let settle, and filter. If sulfide, sulfite, or thiosulfate is present, add 1 mL H2O2 and stir for 1 min. Titration :Directly titrate samples in the pH range 7 to 10. Adjust sample pH to 10 with H2SO4 or NaOH if it is not in this range. For adjustment, preferably use a pH meter with a non-chloride-type reference electrode. (If only a clhloride-type electrode is available, determine amount of acid or alkali needed for adjustment discard this sample portion. Treat a separate portion with required acid or alkali and continue analysis.) Add 1.0 mL indicator solution. Titrate with standard AgNO3 titrant to a pinkish yellow end point. Be consistent in end-point recognition. Standardize AgNO3 titrant and establish reagent blank value by the titration method outlined above. A blank of 0.2 to 0.3 mL is usual. A well-mixed sample is filtered through a standard glass fiber filter, and the filtrate is evaporated to dryness in a weighed dish and dried to constant weight at 105oC. The increase in dish weight represents the total dissolved solids. – fritted disk as filter support. – Suction flask, of sufficient capacity for sample size selected. – Drying oven, for operation at 105 ± 2oC. volumes of reagent-grade water. Continue suction to remove all traces of water. Discard washings. Preparation of Evaporating Dish : If volatile solids are to be measured, ignite cleaned evaporating dish at 550o for 1 h. in a muffle furnace. If only total dissolved solids are to be measured, heat clean dish to 105 ± 2oC for 1 h in an oven . store in desiccator until needed. Weigh immediately before use. Stir sample with a magnetic stirrer and pipette a measured volume onto a glass-fiber filter with applied vacuum. Wash with three successive 1 mL volumes of reagent-grade water, allowing complete drainage between washings, and continue suction for about 3 minutes after filtration is complete. Transfer total filtrate (with washings) to a weighed evaporating dish and evaporate to dryness on a steam bath or in a drying oven. If necessary, add successive portions to the same dish after evaporation. Dry evaporated sample for at least 1 h. in an oven at 105 ± 2oC, cool in a desiccator to balance temperature, and weigh. Repeat drying cycle of drying, cooling, desiccating, and weighing until a constant weight is obtained or until weight change is less than 4% of previous weight or 0.5 mg, whichever is less. Duplicate determinations should agree within 5% of their average. To lay down a standard operating procedure for Decontamination of D.M. Water plant. NOTE: Decontamination of D.M. Water plant is done as per recommendation of Q. C. department or once in a month; after regeneration of D.M. Water Plant. a) Mix 40 ml of formaldehyde solution with 200 ltr of D.M Water. b) Inject this solution into mixed bed unit (MBU) by dipping tube attached to ejector E-2 into the formaldehyde solution and by opening valve 18, 20 & 22.
c) After completion of formalin injection close the valve 18, 20 & 22.
a) Mix 40 ml of formaldehyde solution with 200 ltr. D. M. Water. b) Deep the tube attached to ejector into formaldehyde solution. c) Open valve 4, 5, 6, 7 and adjsut valve 4 to maintain the flow. a) Mix 40 ml of formaldehyde solution with 200 ltr. D.M. Water. c) Open valve 1, 2 & 3 and adjust the valve 2 to maintain the flow. d) After completion of injection close the valce 1, 2, & 3.
a) Next day start the D.M. Water plant (Ref. SOP-ME- ) and drain the water. b) Give the sample of D. M. Water to Q.C. c) After getting OK from Q. C. collect the D. M. Water into D. M. Water collection tank.